During this year’s conference the radio program AgriTalk was broadcasting live once again. 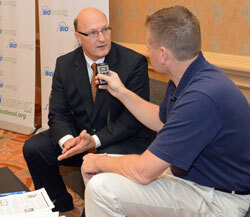 Here’s host Mike Adams interviewing NBB Chairman Gary Haer for the broadcast. The radio show also streams and records video and then uploads segments to their YouTube channel. Anne Steckel: Anne Steckel talks about prospects for getting Congress to renew the biodiesel tax credit. Brent Hajek: Brent Hajek of Hajek Motorsports explains how biodiesel was the key to breaking a land speed record in a stock Ford pickup. Kansas Soybean: Brad Thompson of Bridgeman Oil Company and Don Kramer of Kramer Oil Company explain how biodiesel is making mines safer for those who work in them. BioHeat: Residents in the northeast are increasingly turning to biodiesel to heat their homes. It’s a product called BioHeat, and it provides a drop-in renewable and clean source for home heating oil. Paul Nazarro of Advanced Fuel Solutions and John Maniscalco of the New York Oil Heating Association provide the details.